FoodWasteEXplorer is an online, searchable database of food waste compositional data. It allows users to search for nutrients, bioactives, toxicants and other waste related data in specific side streams. FoodWasteEXplorer has been developed to help tackle food waste by identifying the most appropriate edible and inedible food waste streams for valorisation, therefore supporting a more sustainable and secure food system. It is an online database that provides industry, SMEs, researchers, government agencies and the general public with access to the composition of agri-food chain waste streams. The fully searchable, referenced information can be used to identify the level of certain compounds in different side streams so that the user can explore how waste may be better managed and to identify market opportunities for different uses, such animal feeds, textile fibres, bioplastics or biofuels. The database contains more than 25,000 datapoints added from a variety of sources, including published scientific papers, manufactures’ data and other information systems. Further work on the data will continue to the end of the REFRESH project (June 2019) with a potential for updates beyond this date through EuroFIR AISBL. The database structure has been based on the CEN standard for food data (food data structure and format standard, EN 16104:2012) and is compatible with other information systems (e.g. FoodEXplorer and the QuaLIFY server platform), with easy to use search and reporting systems. 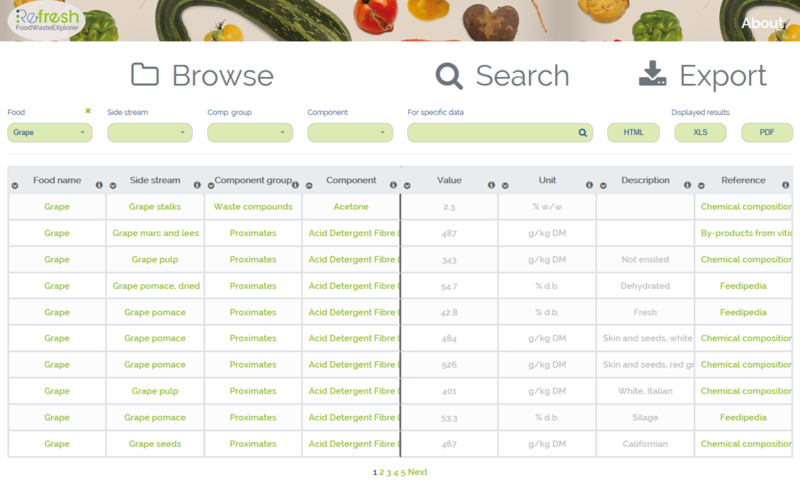 This new database enables the use of food industry side streams as new raw materials for a wide range of product options, leading to decreased waste generation, increased value and sustainability.